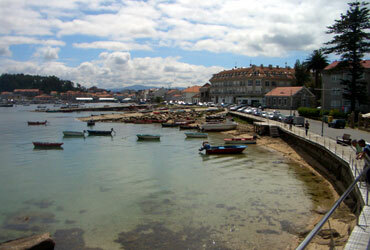 The isla de Arousa is in the province of Ponteverda and is reached by a carriageway that spans the few hundred yards between the island and the mainland. Anyone who watched the Galician section of la Vuelta cycle race on TV in 2013 (and no doubt in 2014) will have seen this stretch of road and the spectacular approach that it makes to the island in the ria de Arosa. The island is very much a holiday resort with some impressive beaches, one of which you traverse as you enter the island. 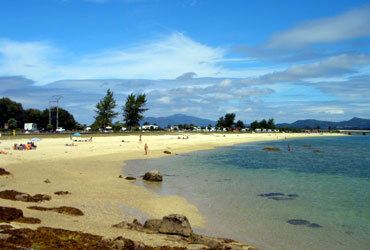 Other beaches are scattered around and all have a yellow coarse sand or a pebble base. The main beaches are very well services with boardwalks and multiple showers, and there are cafes and carparks adjacent to the beach side areas. Some of these carparks also take camper vans (RV's). I have included a photo (left)showing a beach with the road bridge in the background (the bridge is to the extreme right). It sounds odd, but looks spectacular, especially when you are there – it reminded me of the Florida Keys. Moving to the other side of the Ilsa de Arosa you have the main part of town with an impressive port and a small marina. 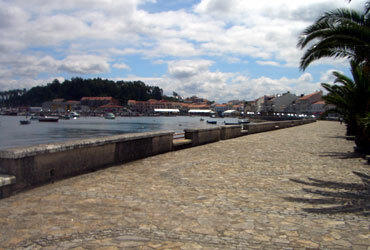 There is a promenade that runs the full length of the portside (see bottom picture). Immediately behind this promenade the street is lined with cafes, bars and restaurants. Out of season these hostelries are quiet, but in August they are overflowing with holiday makers. Nearly all of these restaurant-bars offer a menu del dia (lunchtime menu) at a reasonable price. Typically you can expect to pay between 8 to 12 Euros for a three course meal with a drink. We walked to the far end of the port area and ate on the patio of a fairly large restaurant at 9 Euros per person. For that you got a sizeable starter (in our case a paella style dish), and for me, fried salmon for the main course. You always get either coffee or a small dessert (postre) and, opting for wine, we were surprised to get a full bottle from a small local bodega. By the time we were eating people were waiting for tables, but the was August. If you visit in May, June, September or October the island is much quieter. In addition to the great beaches and the pretty portside area, other parts of the Isla de Arosa are worth exploring. 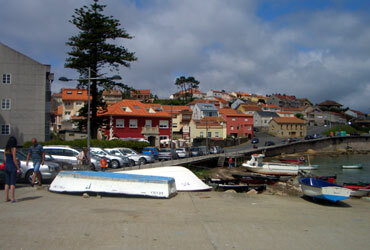 The main town is located behind the port area and there is an older part of town with some original fishermen's houses. You will also find some little churches and more bars and cafes. The population of the Island is around 5,000, but many of the more impressive houses that you will see are holiday homes owned by people from other parts of Spain. Other attractions - A section of the island is now a nature sanctuary for birds, although we did not visit this area. All told, if you have a car and you are exploring this part of Galicia, the Illa de Arousa will make an interesting diversion and a good stop to have some lunch or pick up a sun tan. The island is definitely at its best on a warm sunny day.